I’m pretty late to the harissa game. What can I say, I’ve lived in suburbia for 14 years and don’t get out much. Oh sure, I’d heard of this North African spice blend. I’d even eaten a decent amount of grilled squid with harissa, made by the the one restaurant within walking distance that dares to sell that kind of thing in my sleepy town. But buying and using harissa myself? That took until 2018. If you haven’t yet jumped on the harissa bandwagon, this is a spice blend that is sold as a dry powder or as a paste. The paste, which is what I bought, is much like sriracha – spicy, bright red, sorta like ketchup with an attitude, and strangely addictive. The spice and flavor profile is different, of course, but if you already put sriracha on everything, harissa paste will be your new best friend. So far I have tested harissa paste on eggs (delicious! ), used it as a dip for roast chicken (for sure do this), squeezed some into a simple broth soup (not so simple now, are ya?) and used it as a coating for these harissa-roasted sweet potatoes. Harissa is most strongly associated with Tunisian cooking, but this type of spice blend is widely used across North Africa and has strong culinary inroads around the eastern Mediterranean. And now that it’s been discovered by novelty-seeking global eaters, it’s kinda a darling of everyone. Harissa isn’t one thing. Like curry, it’s a blend of a ton of different spices, and the possible variations are infinite. Sweet red pepper, spicy chilis, garlic, cumin and coriander seem to be pretty common base flavors, but harissa can include everything from saffron to rose petals to mint to lemon. 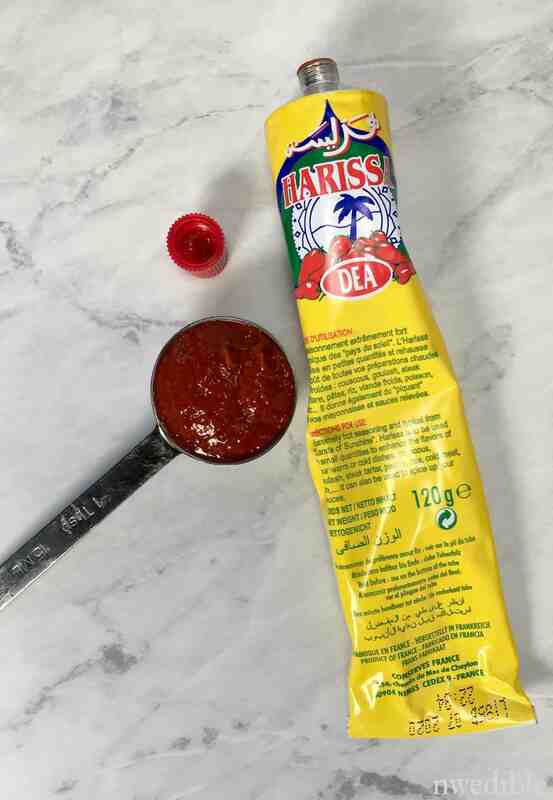 Harissa paste also includes oil. Spice level varies by blend and brand. If you aren’t a fan of spicy foods, look for a milder formulation of harissa, or just adjust quantities down. And for the love of your tongue, if you use a dry harissa spice powder instead of a paste, adjust the quantities! This is the harissa paste I bought and used. It’s described as “extremely hot.” I put it more like “medium.” I thought it was more akin to sriracha in heat than something that would be marketed as “Death by Capsaicin” or similar. But I like spicy foods, you should adjust quantities to taste. I like roasting sweet potatoes in big chunks. If you maximize how much flat surface there is on your chunks, you’ll get more delicious caramelized spots. The sweet potatoes are tossed with oil, harissa paste, and salt. Simple. After roasting, they are caramelized and tender and sweet and a little spicy, all at the same time. Nearly perfect. But to really make your harissa roasted sweet potatoes sing, they need just a kick of acid. 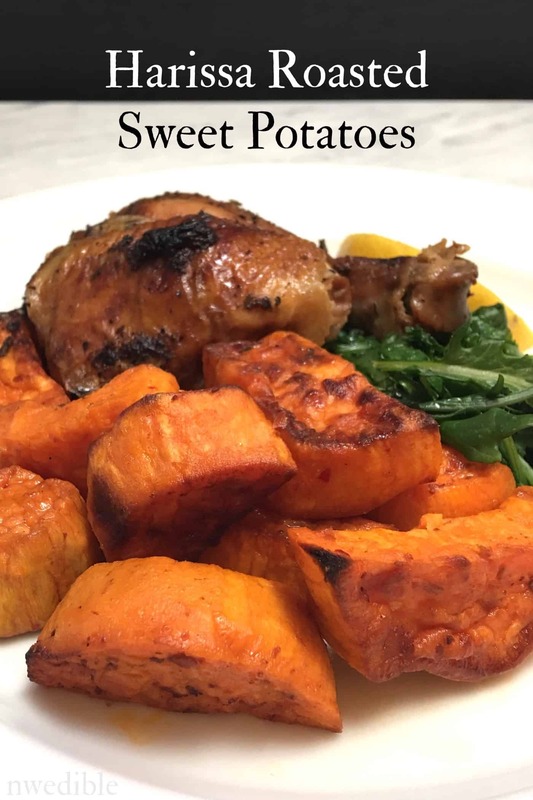 Drizzle a little fresh lemon juice over your sweet potatoes while they are still warm, right before serving, and all the flavors will come together beautifully. 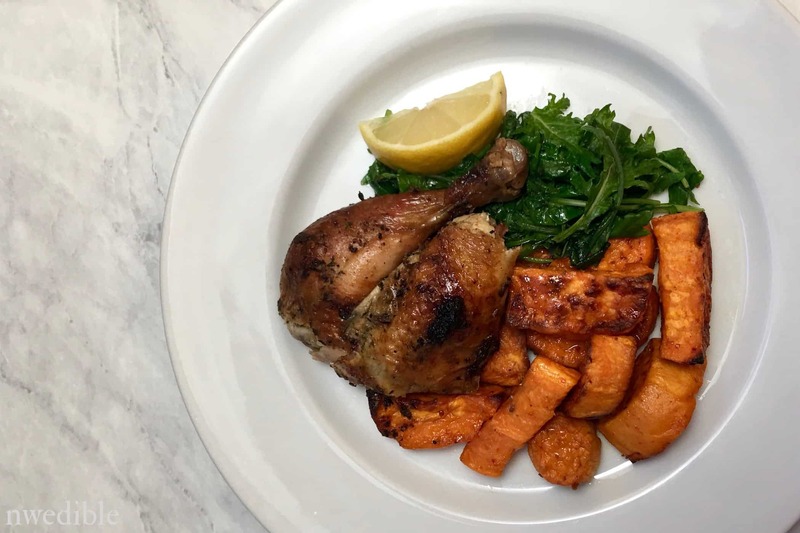 The harissa roasted sweet potatoes would be a perfect side dish for meats roasted or braised in a North African style, but they played really well with this fairly pedestrian lemon-herb chicken too. Let the harissa sweet potatoes cool to room temperature and they’ll make a great addition to a hearty salad. 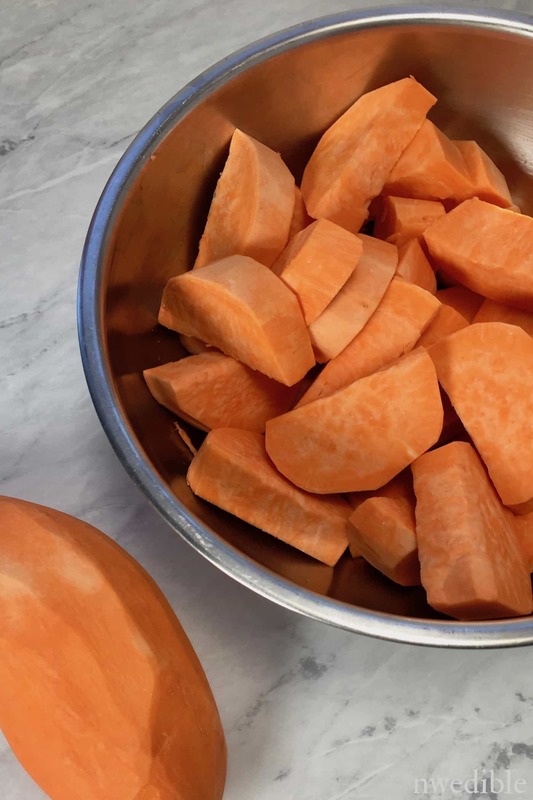 These easy roasted sweet potatoes are seasoned with spicy harissa paste and make an excellent side dish for roasted or braised meats, or addition to a hearty salad. Adjust the oven rack to the center position and preheat the oven to 400 degrees. Line a sheet pan with parchment paper. Scrub, trim, and peel sweet potatoes. 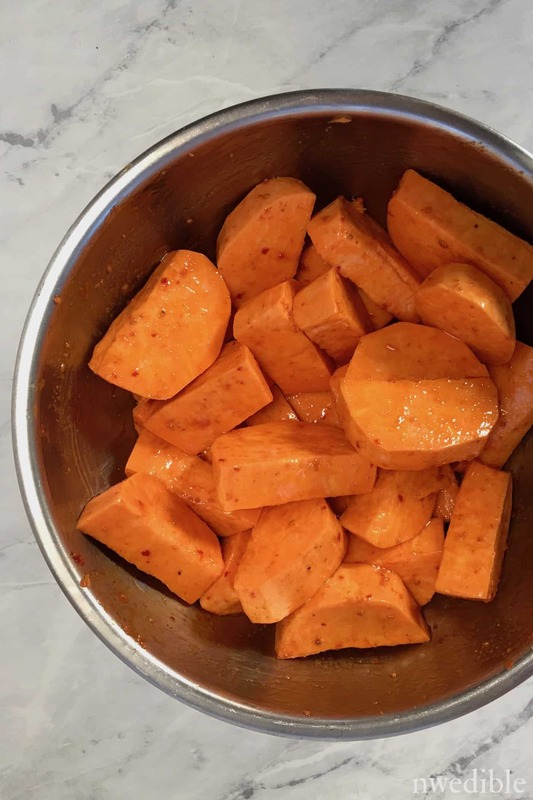 Cut sweet potatoes into large chunks. Whisk together the olive oil and harissa paste. Toss the sweet potato chunks into the harissa oil, and season to taste with salt. Mix until the sweet potato is uniformly coated in oil and seasoning. 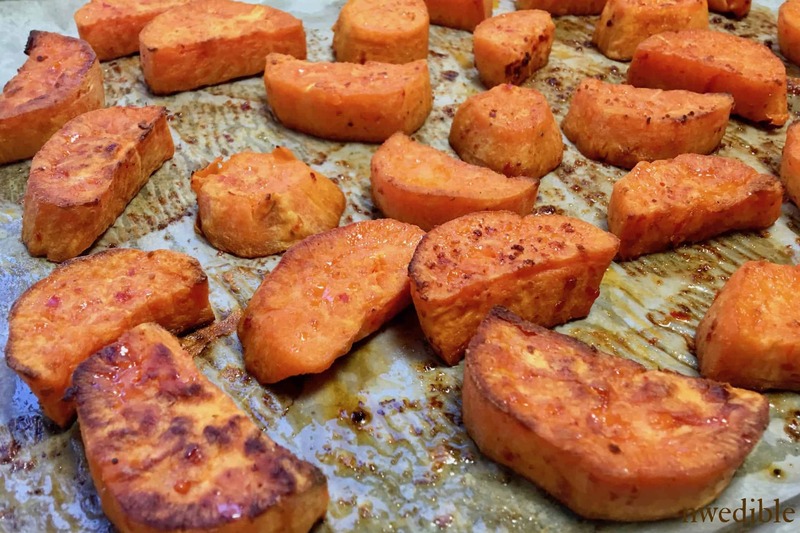 Arrange the sweet potatoes in a single layer on the prepared sheet pan. 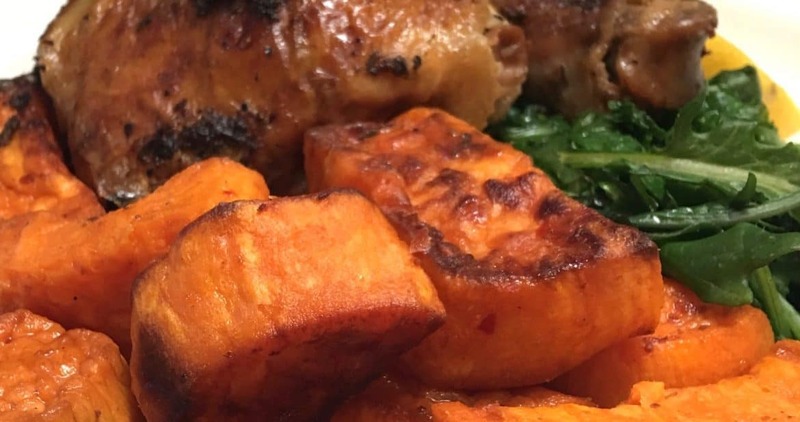 Roast for 35-45 minutes, or until the sweet potato chunks are golden, crispy, and tender all the way through. Stir the sweet potatoes once, half-way through the cooking time. Remove the sweet potatoes from the oven. 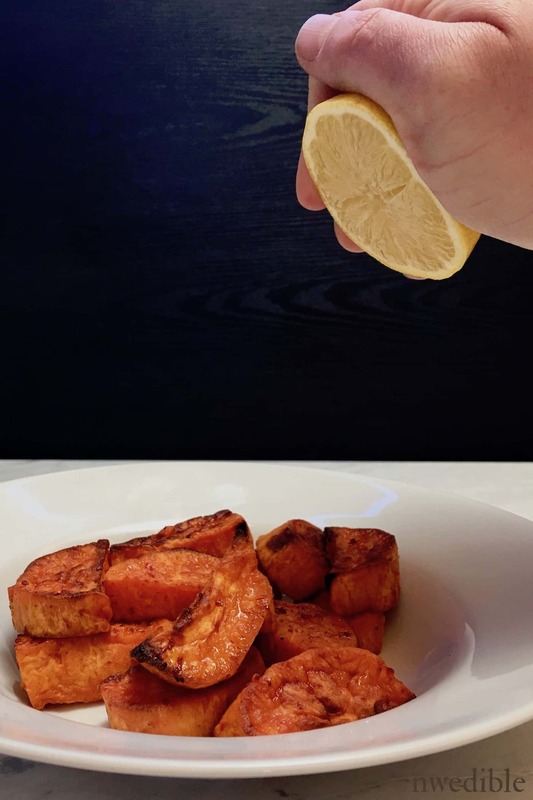 Just before serving, spritz a little fresh lemon juice over the sweet potatoes. Harissa Paste is a spicy Tunisian condiment and seasoning made from a blend of hot peppers, spices and herbs in oil. It's used widely in North African cuisine as seasoning for meats, fish, soups, bean dishes and more. Like curry, the flavor and heat of harissa will vary based on formulation. Please adjust the amount of harissa paste you use to your taste, preference for spicy foods, and to the specific harissa formulation you have! Yum! A friend just passed on a recipe for roasted sweet potatoes with cumin, chili, s&p, olive oil then topped with crumbled goat cheese. Very tasty! Also, find the harissa chicken recipe from Dinner: Changing the Game by Melissa Clark. It is fantastic with the potatoes and leeks. Definitely use the yogurt sauce and tons of fresh herbs. ???? Thank you for the new flavor exploration! I am so excited to see this recipe! I canned homemade harissa (more of a sauce vs paste) last year and it’s amazing and I am not 100% sure how to use it. This looks fantastic and I’ll be giving it a try this week. thanks for the recipe! wow, would you consider sharing your canned homemade harissa recipe?? Thanks!! I’m hoping this will do ‘something’ for the winter squashes patiently waiting .. and waiting … for inspiration : ) Sweet spuds being sort of cousins…. kinda. These sound like they would definitely be a hit in my household. So excited to try making these the next time I head to the grocery store. Have you attempted making your own harissa at home? I feel like that would be a fun project! Thank you so much for sharing. Can I make this a day in advance and reheat?